Centralized mail delivery provides delivery and collection services to a number of residences from a centrally located installation – whether in a single-family subdivision or multi-family structure. Business customers also receive delivery services from a convenient central location. The U.S. Postal Service now specifies centralized mail delivery in nearly all new construction because it is the most efficient method of providing the best service, which helps keep the cost of mail service affordable. Centralized mail delivery equipment can be in the form of any “clustered” style of mailboxes including free-standing, pedestal mounted Cluster Box Units (CBU), or other Standard 4C (STD-4C) compliant mailboxes mounted in or on a wall. Manufacturers must produce a mailbox which meets or exceeds all US Postal Service (USPS) Specifications and then submit a prototype to the USPS for rigorous testing and approval. Once accepted, the final product will receive the appropriate designation and be approved for use. All STD-4C compliant mailboxes must meet the USPS design and installation regulations to receive a “USPS Approved” designation; while all CBUs must also be officially licensed by the USPS. Not only is approved centralized mail delivery equipment now specified by the USPS for nearly all new construction projects, but newer types of equipment may also be required for any major renovation to older existing mailbox installations. For instance, if your project will disturb the rough opening of the wall your mailboxes are currently mounted into, new centralized mail delivery equipment such as the STD-4C may be required. 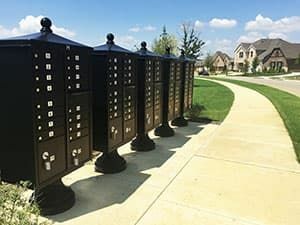 Besides wall-mounting, it is also vital that subdivision regulations and other community planning guidelines address the need to review and include common space planning for centralized mail delivery equipment – an all too often last minute consideration. This important public service should be addressed early in the planning process to provide developers with comprehensive resources which will help avoid headaches later and ensure mail delivery is not delayed. Effective pre-planning not only allows for the creation of a true community gathering area, but ensures that residents will not have to stand in the street, or have limited access to safely retrieve their mail and packages. It is important to check with local postal officials prior to planning any mailbox installation to ensure local requirements and proper placement is included in the overall design plan. See our Postal Regulations page for contact information. Proper planning for appropriate common space in highly visible, centralized areas provides greater protection from mail theft and vandalism as well as better accessibility and safety in retrieving mail and packages. Placement of cluster boxes in a new development should always be done in collaboration with local Postal Service delivery planning contacts to ensure proper site selection. It is very important to site cluster boxes in proximity to sidewalks for good accessibility for both customers and carriers; including sufficient turnaround space in front of the equipment. The USPS Delivery Planning Guide for Builders and Developers elaborates. The U.S. Postal Service specifications require one (1) parcel locker for every ten (10) mail compartments (1:10) for each centralized installation location. These parcel lockers can be added within each individual mailbox module or grouped together in one location near the mailboxes. Due to the increase in online shopping, package delivery has continued to increase exponentially. The USPS parcel locker requirement was established in 2006 when package volume was significantly lower, so a ratio of one (1) parcel locker to every six (6) mail compartments (1:6) should be considered to meet current demand. Sequential numbering identification (unlike assigning mailbox IDs that match apartment or house numbers) of mailbox compartments may allow greater flexibility in providing accessible mailbox compartments that meet accessibility regulations which are applicable to your project. It also provides greater security and privacy for residents. Centralized mail delivery is the most cost effective, sustainable method of delivery. With deliveries to more than 300 million people at 152 million locations every day, and 1 million new delivery points added each year, the benefits for both the U.S. Postal Service and its customers - residential and commercial alike, are obvious and real. Multiple deliveries per stop results in faster service for customers due to less time per delivery stop, resulting in lower costs - the Postmaster General’s office estimates that door delivery costs the USPS about $353 per address each year while curbside delivery costs $224, and centralized delivery equipment $160 per address. Larger compartments hold several days’ worth of deliveries without rolling or folding the mail, and convenient built in package lockers eliminates the need to be home or at the office during services hours - reducing extra trips to the Post Office® to retrieve items. Highly visible centralized mail centers are safer than isolated delivery locations for residents and help provide greater protection from mail theft and mailbox vandalism. Locked and secure mail collection saves residents trips to the Post Office® or collection boxes and protects contents from the weather better than unsecured receptacles. Eliminates curbside “clutter” with more efficient use of space beautifying neighborhoods. Builds stronger neighbor relationships and trust as residents meet and talk while retrieving their mail - increasing community collaboration and awareness. Costs less to install per resident than individual mailboxes and mail delivery can often begin even before residences are occupied. Centralized mail locations reduce risks to letter carriers due to unleashed dogs and poorly maintained sidewalks. Fewer vehicle stops results in lower vehicle maintenance costs. Postal Growth Coordinators Can Help! With deliveries to more than 300 million people at 152 million locations every day, and 1 million new delivery points added each year, this guide is provided to better assist you with preparing your new development for mail service by planning locations and space for mail equipment early in the development process. Every area where the U.S. Postal Service provides mail delivery also has a Postal employee assigned to help developers and builders with planning mail service for new development. These “new delivery planning” employees are referred to as Growth Management Coordinators. To find the Growth Coordinator that covers your specific development geography, please contact the nearest Post Office and ask to speak to the Growth Manager and/or person assigned to assist with developers with planning new mail service. The USPS Delivery Growth Management webpage provides more.